Hello to our new and existing subscribers. Thank you for your ongoing support. The full newsletter is available here. March was difficult. The devastating act of violence against humanity in Christchurch was too much to bare. I was inspired and humbled by the way Jacinta Arden demonstrated such genuine empathy and authentic leadership. I think about her own family and husband and child at this time. How they must be missing her as she leads her country back to its feet. I also can’t help to think that Jacinta’s demonstration of authentic leadership may have contributed to Gladys winning the NSW election. Our first female elected Premier. I was also angered when someone said to me, “I think she is perfect for the job. She has no kids”. We have a long way to go. Congratulation Gladys. I wrote to Gladys this week!. I was recently in Orange and met some outstanding people. One young man (let’s call him Scott) was recently married and expecting his first child on the weekend. Problem being, he had just lost his job. He was the Program Coordinator for a high risk youth group home. The boys in the home required 24/7 supervision, case workers and support workers. If these boys were not in Scott and his team’s care, they would be in jail or worse. They were not suitable for foster care or adoption and the stories of their early lives are beyond devastating. The home was shut down, the boys had to be rehoused and the staff cohort were all made redundant! Why? They lost their funding. In the last tender, a competitor won the funds for the program. That’s all well and good, but the new operators were not ready to go by the time Scott’s program lost the funding. I just can’t see how this could happen. How an amazing committed and talented Coordinator, his team and his tenants are all displaced because the new program owners were not ready!? I was totally baffled. So I wrote to Gladys. I’ll let you know if I get a response. On a positive note, Scott’s son was born and I may have found him a job. Anyone would be lucky to have him. My final message this month is related to age discrimination. Can everyone please rethink age. The experience, professionalism, maturity and commitment of older people is exceptional. Their influence on the younger generations is positive and I’m heartbroken again and again for our candidates who are knocked back because of their age. Image if it was you? I’m sure you still think you do a great job and can learn new skills. I encourage you all to remove age from your selection criteria, even when its unintentional. Enjoy the rest of the information provided below. We have some great projects on as well as roles in the NFP sector. Its a busy time. Historically March is always a big month as people seem to ramp up after the new year. The team and I look forward to seeing you all soon. As sponsors of the 2019 AHI Awards, we will be at each state ceremony and then of course the big one in Darwin later in the year! 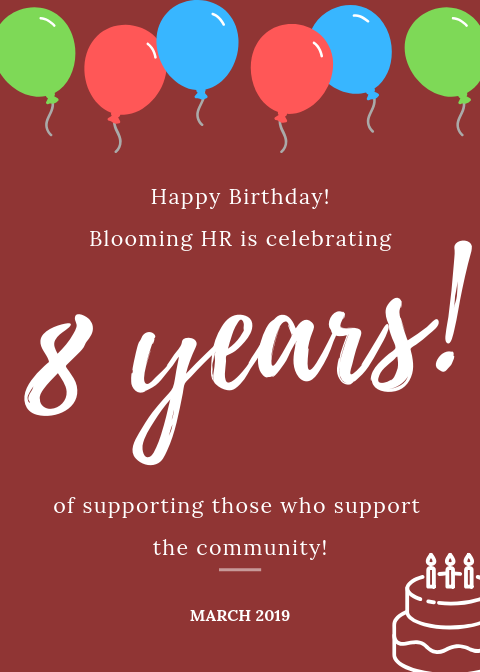 Oh, and we also turned 8!